The North Atlantic is not the only ocean in the world, and is not necessarily the solitary source for the kick off of global cooling, although in the Northern Hemisphere this ocean body is by far the most relevant weather maker. Only in some distance the Arctic Ocean and the North Pacific follow. The dominance of the ocean regions beyond the equator toward the Antarctica over the Southern Hemisphere is another subject. First some words about the other two ocean areas north of the equator before putting focus entirely on the North Atlantic, both are subjects in further sections. 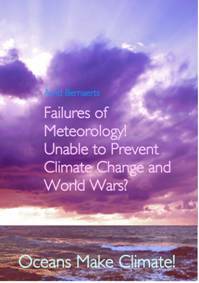 The next section concerning the North Pacific covers the naval war period from 1942 to 1945 (Chapter H), the other the Arctic from where secular warming started at the end of WWI in winter 1918/19 (Chapter I), which raises the question about the reason for global cooling 20 years later. Figure G3-1; More information in Chapter I.
shift and that there was briefly a very pronounced signal towards reversal (see: Fig. G3-5, below). Over a longer period of time the shift did not come as a very steep and long lasting decline. Although the timing fits well with the naval war thesis, it would require another type of research to bring more light into this matter. However these general observations allow the assumption that the development in the Arctic from the onset of WWII speaks more for rather than against the naval war thesis. North Pacific vs North Atlantic With regard to winter temperature structure in the Northern Hemisphere the North Atlantic is by far the major contributor, followed in quite some distance by the North Pacific (north of 30°, e.g. Shanghai, New Orleans, Cairo, to 60°N, e.g. Oslo), and Arctic Ocean. The continental land masses, particularly those covered with snow, contribute very little. The point to make is that a significant cooling during the winter season over the North Atlantic (since 1940) showed up in the North Pacific (since 1942) as well. The North Pacific has no equivalence to the current system in the North Atlantic that supplies the Arctic Ocean with warm water from the Gulf Stream . Therefore the major driving force of the Northern Hemisphere winter weather is, in my opinion, the North Atlantic . 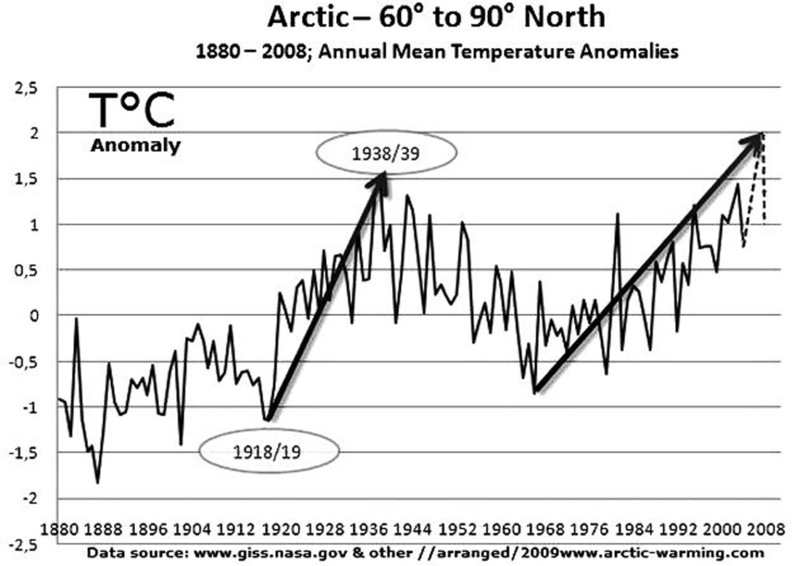 The point had been unknowingly tested at the end of WWI with the early Arctic warming from 1919-1939, as shown in the image “ Arctic- 60° to 90°N”, above and discussed in the Chapter I . .
One of the weakest points in climate research is the lack of reliable sea temperature and salinity data, across several sea layers and over many decades. A climatic research that is not capable of understanding that these data are needed in high number and frequency is weak and not capable of giving advice on protecting climate from anthropogenic changes. The current material available is hardly more than an initial approach, and hardly sufficient for in-depth research. That generally applies to historical data, including data taken during war times, as frequently expressed and underlined by special investigations (Bernaerts, 1976 & 1977). As far as sea-surface data (SST) have had their value for weather forecasting, which is no way questioned, it does not mean that they have a similar value for analysing climate change patterns. At best they may indicate a trend, if carefully analysed, and applied. That is in no way possible for SST taken during the time of major wars. Any ‘adjustment’ is speculative. The most one might get from a data series is a trend. Figure G3-2; As effective as the wind. 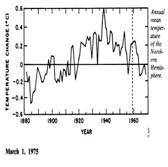 The SST trend in the North Atlantic region changed around 1940. Until then there had been a significant warming trend (Figure G1-5), which corresponds to the situation throughout the Northern Hemisphere and on a global basis (see Fig. G1-3). What seems necessary to note is the margin of change one is talking about. 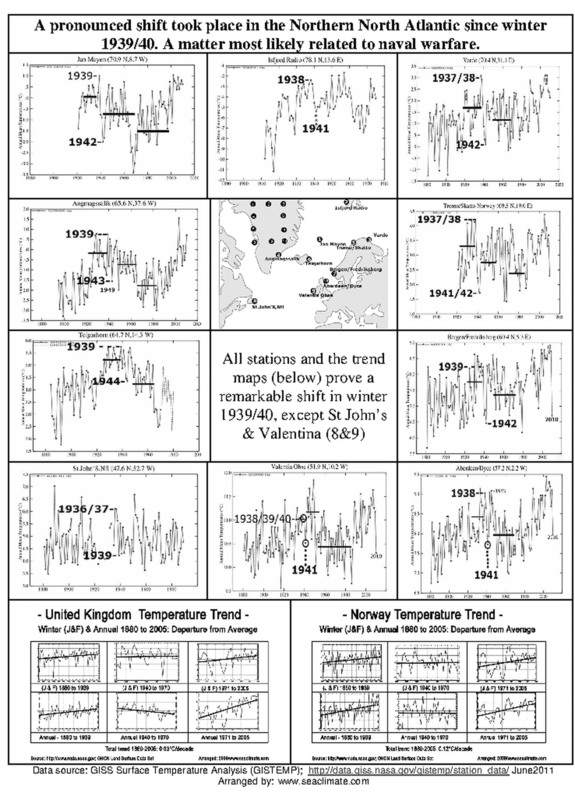 It is at most one degree over a time period from around 1900 to 2000, based on data for the North Atlantic . As the error margin for each SST measurement taken was in the range of about 0,5° to 1°C, one should highly question the usefulness of such data for climate research. Fig. 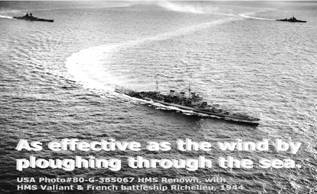 G3-3; Naval war in the Atlantic during nine months in 1941. 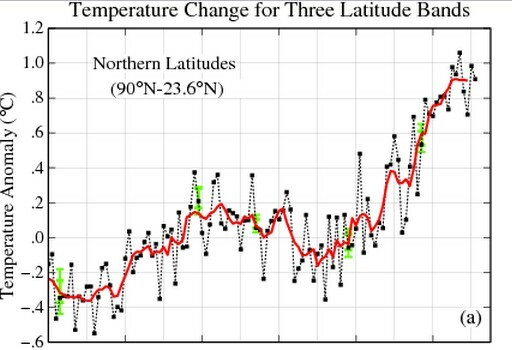 From the available SST data set it seems difficult to follow the recent opinion of Thompson et al (see sec. G1a), that: “the hemispheric differences in temperature trends in the middle of the twentieth century stem largely from a rapid drop in Northern Hemisphere sea surface temperatures of about 0.3°C between about 1968 and 1972”. 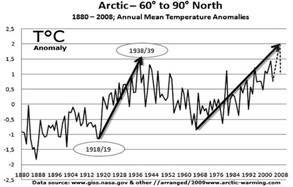 The most significant trend change happened between about 1940 and 1942, which should be explained first before considering a subsequent change at the end of a three decade cooling period. c. What can NAO tell? 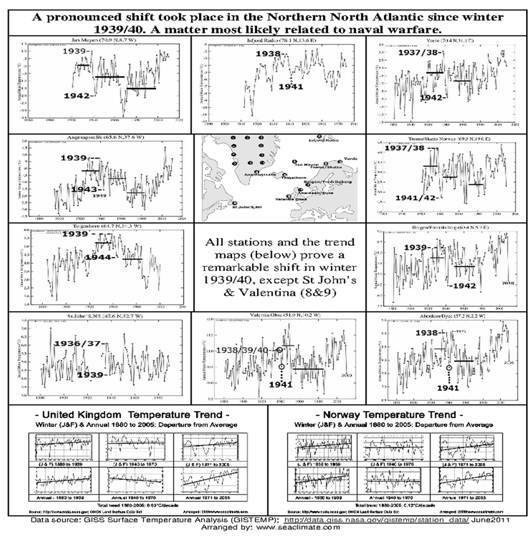 The North Atlantic Oscillation (NAO) is not really useful in our case, even though it is said that the sequence of cold winters in the 1940’s correspond to variations of the NAO Index. This would correspond to similar cold conditions in the 1960s and warmer conditions in the 1990s. The NAO Index relates to the speed of mid-latitude westerly winds, and is measured by the difference between air pressures at two places, at the same longitude but widely separate latitudes ( Iceland , 65°N, and the Azores , 40°N). Whether this analytical concept can be made fruitful for exploring the influence of the WWII years is hardly possible to be answered here, as in the 1940s it was still not the time to collect relevant data. But that intelligent research may nevertheless bring about interesting results, if not evidential correlation. The observation by James Bhend (A2h, p.10), is that there had been a strong increase of cyclonic activities during the WWI and WWII period. d. A link between the North Atlantic and Europe ? · “The decadal oscillation in North Atlantic sea surface temperature is the driving force behind observed variations in European climate during 20th century. 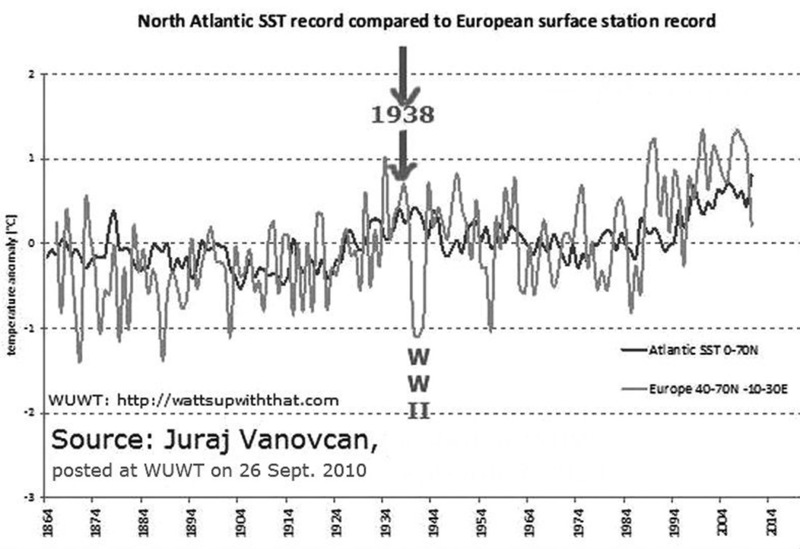 Long-term North Atlantic SST trend is well correlated to European temperature station records”. Fig. G3-4; North Atlantic sea surface temperature versus air temperature in Europe . The ultimate starting point remains the question what caused the air and sea water temperature across the North Atlantic region to decrease over three decades. 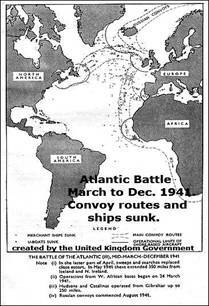 Was it an ocean issue alone, or did the Battle of the Atlantic contribute? 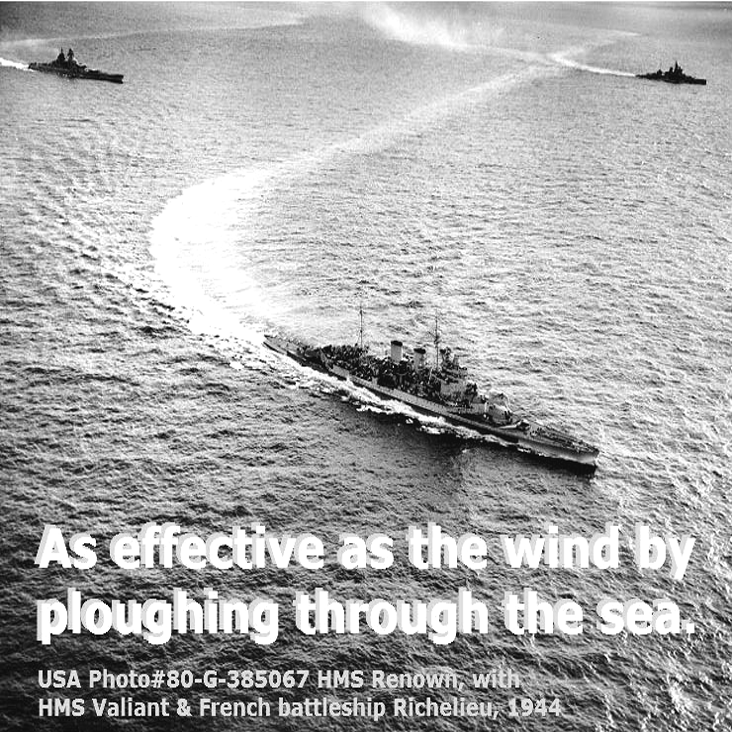 Fact is that the temperature coincided in perfect timing with naval war activities, as indicated in a number of graphics in this section. Fact is also that the water of the North Atlantic circles the basin, in a rhythm of about four years. A letter bottle released off Cap Hatteras needs less than half a decade to show up here again. When Western Europe faced the late and severe winter 1946/47, that water body was already in the midst of the second full circle, from a starting point in 1940. This is reflected in a comparison between a maritime country, e.g. United Kingdom , and a continental country as shown in the numerous trend images in Chapter A2. While the annual data for e.g. the UK , Ireland , and The Netherlands show a significant decline from 1940 to 1970, in Germany, the Ukraine etc. 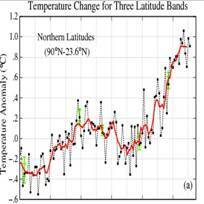 annual temperatures continued to rise modestly (see Fig G1-7 to G1-10, p.168. The maritime influence is obvious. It does not support the claim that air pollution was the source. All considerations provide a strong indication towards the role of the North Atlantic as a dominating source for the three decade lasting cooling period. As the correlation with naval war activities is close, the Battle of the Atlantic is a contender as a supporting source, and even a strong contender, as long as convincing reasons are not named and convincingly discussed. I What is the truth? 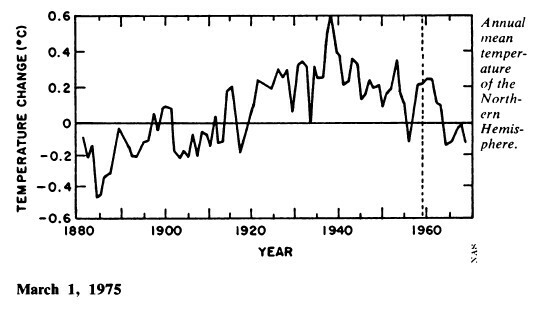 The National Academy Of Sciences produced this graph of Northern Hemisphere temperatures, which showed a strong cooling trend from the late 1930s until the late 1960s. It showed that the 1930s was by far the hottest decade.